Discover Coyote Valley has had a busy spring with workshops in the Valley and a successful planting at Ann Sobrato High School. Doug McConnell has been scouting the Bay Area for places to feature in his new “Open Road” series. Previous host of “Bay Area Backroads,” McConnell found that there was still much to explore throughout the Bay Area, with the Coyote Valley a new favorite place. Among the new locations that McConnell is most excited about is Morgan Hill’s Coyote Valley, an expanse of undeveloped farmland at the narrowing of the Santa Clara Valley south of San Jose. Just minutes away from the traffic and congestion of the tech epicenter is a world unchanged by the innovations of the last decades. Read the SF Chronicle Article about the upcoming series. Just like Doug McConnell is getting out onto the road and into the Coyote Valley, so is Discover Coyote Valley hitting the fields and digging into our work in the Valley, engaging with students, growers, community members, and partners. On April 17th, Ann Sobrato High School students had a successful day of planting a hedgerow at their school farm. Students, part of the Future Farmers of America program, are planting hedgerows to help protect and conserve their school farm’s natural resources. 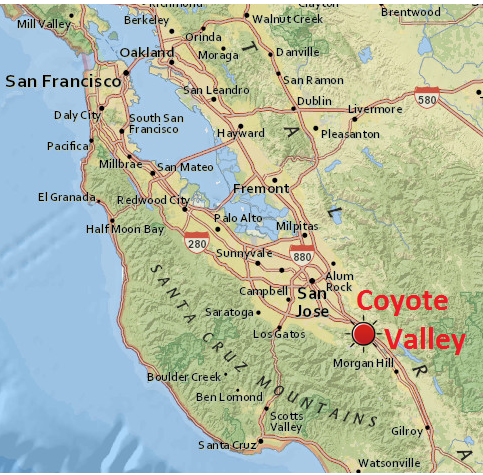 Discover Coyote Valley is working with the high school to expand their school farm out to ten acres. Read the Article in Morgan Hill Times about the planting! It’s not just high school students who are learning from the Sobrato school farm. Students from De Anza College surveyed the farm site for local bird nesting populations. Students found fourteen species of birds using the field and four red-winged blackbird nesting sites. 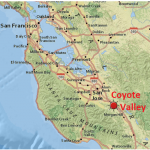 Discover Coyote Valley hosted two workshops this past month. The Hummingbird Workshop featured conservation and wildlife experts, and included presentations from Sobrato High School students in the environmental club. Over 20 students, conservation experts, and engaged community members learned about how to support hummingbird populations through habitat conservation. Irrigation expert Michael Johnson led a workshop and field day on water efficient irrigation systems for greenhouses and row crops. Cantonese greenhouse growers throughout the Coyote Valley joined for a day of valuable farming knowledge and technical assistance about improving water conservation on their growing operations.Interested in learning more about irrigation management systems? Contact Michael Johnson about his services, at desol@calcentral.com or 831-325-3376. Up next, we’re looking towards the opening of the Coyote Valley Open Space Preserve, which will open to the public on June 27th. Santa Clara County Open Space Authority will be hosting a public opening, and Discover Coyote Valley hopes to see you there!